A resident of the city's downtown claims to have seen strange activity in the area of the islands. He said that that an unidentified flying object flew over the area. During a radio interview with Radio 2, Osvaldo (surname withheld) claimed seeing an object with red, white and green lights half an hour past midnight on Tuesday. The object flew over the riverine islands for a little over four minutes. When interviewed by Ciro Seisas for the "A Diario" program, Osvaldo said that a series of strange motions in the sky drew his attention: "I was in bed, looking upward, and I saw something fly by. I told myself, what a strange airplane." However the aircraft's movement and a series of lights led him to suppose that no airplane was involved. "It had red, white and green lights that spun constantly." According to this local resident, the strange event over the islands brought up the possibility of extraterrestrial life once again. 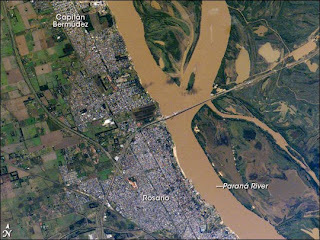 The object "flew over the river in the vicinity of the islands, and descended, vanishing from sight a few minutes later," Osvaldo explained, asking that anyone else who saw the object to step forward and corroborate his claim. "I'm certain it wasn't an airplane." Other locals claim having seen something strange, while others rejected the possibility that a UFO could be involved.